Conditional breakpoints- customize your breakpoints so that your program pauses only when a specified set of conditions is met. 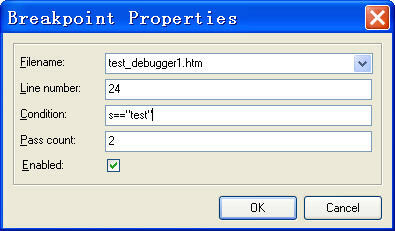 AxScripter provides two types of breakpoint conditions: Boolean expressions and Pass count. Tooltip expression evaluation-When you are debugging and you are stopped, you can place the mouse cursor over any variable or property name in the code editor to display its value at that time. Break at Next Statement-AxScripter support cause break feature. In certain cases, you may want to enable the Script Debugger Break at Next Statement if the next statement that runs is not in the .js file that you are working with. For example, if you set Break at Next Statement in an .js file residing in an application called Sales, the debugger will start when you run a script in any file in the Sales application, or in any application for which debugging has been enabled. For this reason, when you set Break at Next Statement, you need to be aware that whatever script statement runs next will start the debugger. JScript Debugger Statement Debugging-To add breakpoints to your scripts written in JScript, insert a debugger statement before a suspect line of script. For example, the following script includes a debugger statement that interrupts execution and automatically starts Script Debugger each time the script loops through a new value. Remember to remove debugger statements from production .js files. VBScript Stop Statement Debugging-You can also add breakpoints to your scripts written in VBScript by inserting a Stop statement at a location before a questionable section of script. Remember to remove Stop statements from production vbscript files. Locals variables window - The Locals variables window automatically displays all declared variables in the current procedure with values. Powerful code editor-editing and viewing source code with powerful syntax highlighting, text folding, text structure tree view, Stack-based markers , Unlimited bookmarks and Multiple Sync Edit regions. Gutter with multiple bands, line numeration, Line highlighting, image, hint, position may be associated with the gutter object (for example, like breakpoint or current execution point). 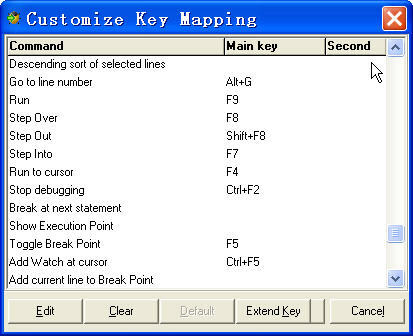 Key mapping scheme - The following key mapping modules are available, Visual Studio.NET ,Eclipse and Delphi. To change key assignments for editor commands you can use "Key mapping" customize dialog. Customizable desktop settings-Arrange the desktop as you want it including displaying, sizing, and docking particular windows, and placing them where you want on the display. You can save your desktop settings and create as many layouts as you like.